If you want a fish tank that attracts attention and starts conversations (but you aren’t quite ready for a super high-maintenance fish-keeping experience), you should definitely consider African cichlids. African cichlids are some of the most vibrant and colorful freshwater fish you can find. This means that you get all the benefit of keeping gorgeous fish without the added difficulties of maintaining a saltwater tank. They’re also lively, gracing your tank with beauty and personality. While they are fun to keep and somewhat easy to care for, it’s important to know what you’re getting into before deciding whether keeping African cichlids is the right choice for you. 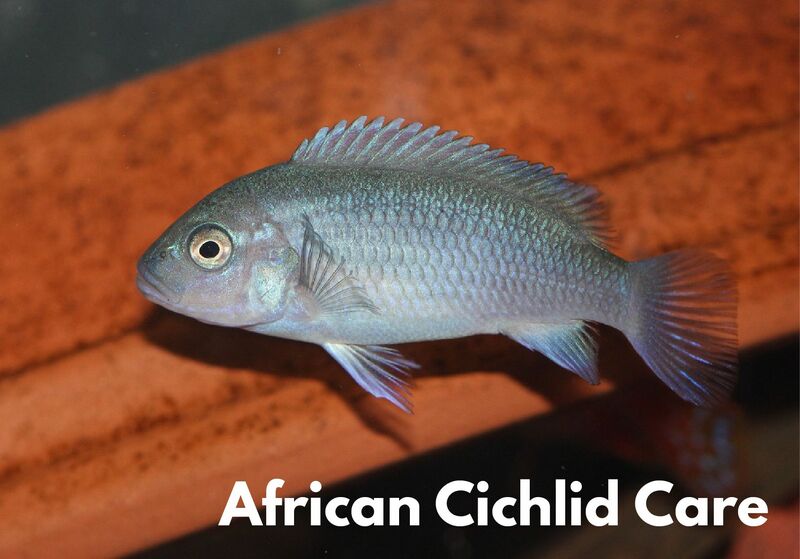 First, we’ll look at some of the African cichlid types you’ll probably come across from breeders and pet shops. Note that these are not scientific names and do not represent distinct species. Instead, they are descriptive terms used by breeders, pet retailers, and aquarium hobbyists. There are hundreds of African cichlid species, though most of them are only found in the wild. The types described here are those most likely to be available for purchase as a pet. Each type of African cichlid has its own unique combination of colors, patterns, and other physical traits. It’s important to note that cichlids generally won’t display any of these distinctive colors until they are around one year old. Hap Cichlids? Mbuna Cichlids? What Does It Mean? 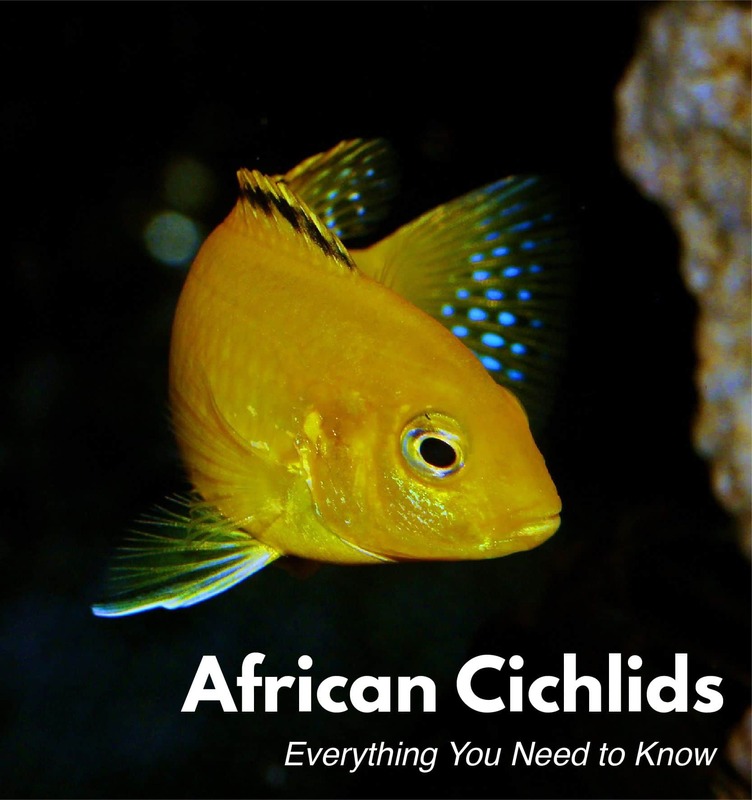 You’ll probably see both of these terms used as you shop for and read about African cichlids. 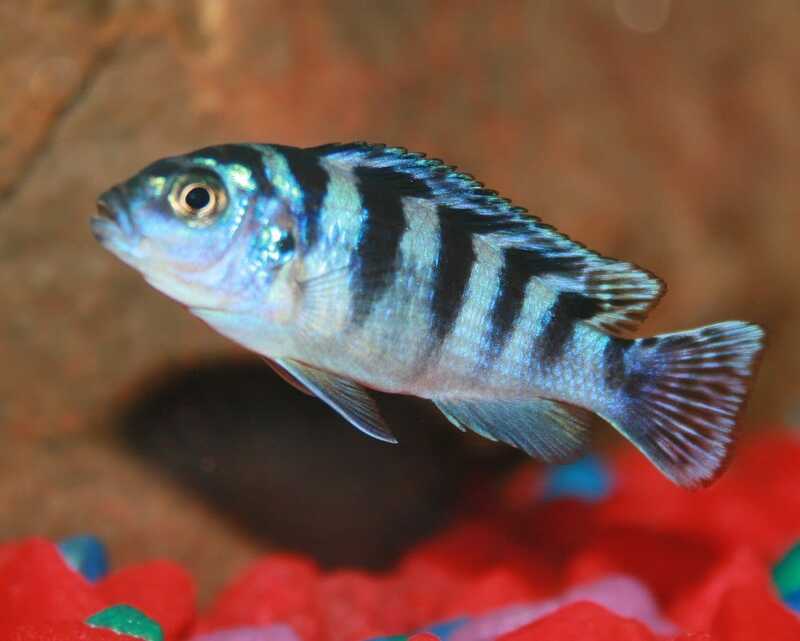 Unscientifically speaking, most of the African cichlids you’ll find are considered to be either Hap or Mbuna, which are both endemic to Lake Malawi. This lake is home to more cichlid species than any other body of water in the entire world! Without getting too deep into the very dry and boring taxonomic history of it all, Hap is short for Haplochromus, a genus of Lake Malawi cichlid. Over the years, many fish once classified under this genus have been reassigned to other newly established genera. However, most are still commonly known as Haps. Mbuna, to put it very simply, is the common term for the other main group of Lake Malawi cichlids. Haps swim in open water, Mbunas prefer to dwell among rocks. While both are decidedly aggressive fish, Mbunas tend to be more so. Female Haps are usually less colorful than male Haps, whereas both sexes of Mbunas usually display bright colors. In the wild, Haps prefer to hunt and eat small fish. Mbunas are usually strict herbivores. Peacocks are sought after for the brilliant colors they display. These cichlids are often less aggressive than some of their cousins, but still more so than many other species of fish. Peacocks hang out around the bottom of the aquarium; in the wild, they hunt for food in the sand. There are many different kinds of peacocks, with names such as Midnight, Red Shoulder, Fairy and lots more. The African Butterfly cichlid is distinguished by the five black stripes running vertically along its body. 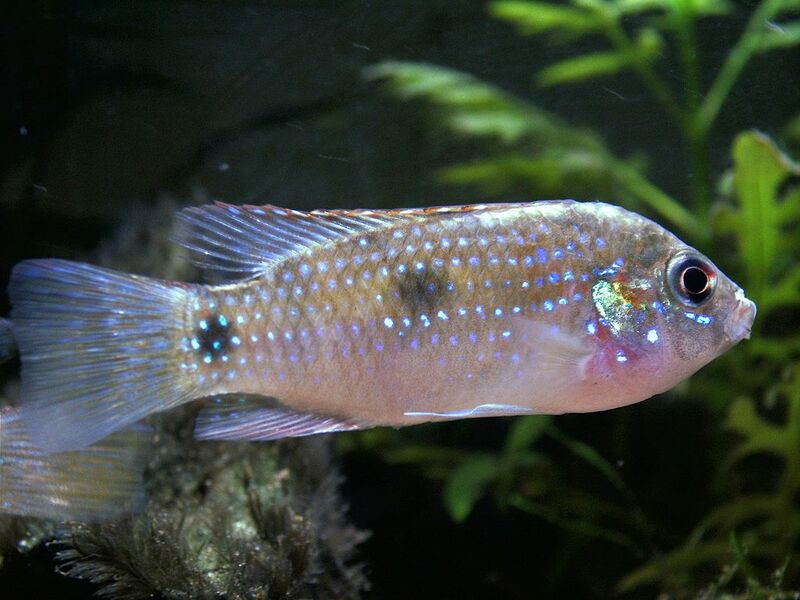 They are relatively easy to care for (compared to other cichlids) and have a somewhat docile personality. There are many reports of them getting along with other types of fish, which is rare for cichlids. The Orange Zebra cichlid’s name comes from its markings: black stripes (or sometimes blotches) set against an orange-colored body. Their heads are rounded, and some display black-tipped fins. They typically grow to about 5 inches long. This is a particularly aggressive variety of African cichlid, so take precautions when placing it in a tank with other fish. A popular Mbuna cichlid, the Zebra Mbuna is not to be confused with the Convict, which is sometimes called the Zebra. The Convict, however, is from Central America rather than Africa. As one would imagine, this fish has distinct black and white stripes on its body. 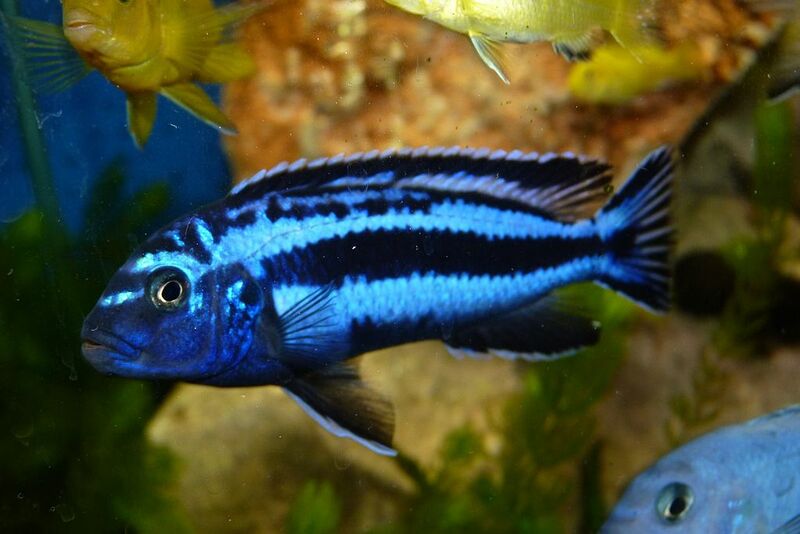 This African cichlid is a vibrant addition to an aquarium with its striking blue color. It is sometimes called the Electric Blue Hap or the Hap Ahli. Suitable for new cichlid-keepers, the Electric Blue is relatively easy to care for and can sometimes cohabitate with other cichlids. A word of warning: don’t place your Electric Blue African cichlid in the same tank as a Peacock cichlid. This almost always results in territorialism and fighting, particularly between males. Another good choice for less experienced fish hobbyists, the Electric Yellow cichlid is small (usually about 3 inches) and somewhat less aggressive than many other types of cichlids. 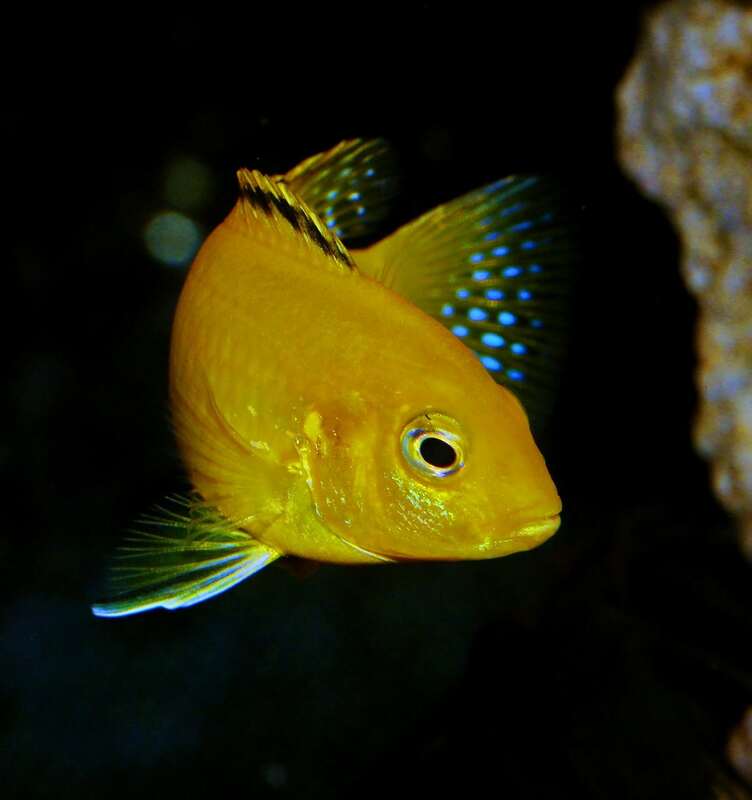 The distinguishing feature of the Electric Yellow is its bright yellow coloring, accented by stark black on the tips of its fins. It also has a notably long dorsal fin, which runs the entirety of its body. Other names this African cichlid goes by include Yellow Lab and Lemon Drop. The African Buffalo Head cichlid goes by many names. A few of them are Humphead, Lionhead, and Blockhead. These descriptive monikers all come from this fish’s unique appearance; it has a very prominent forehead. These cichlids are fairly easy to keep for the beginner-level enthusiast. They grow to be around 4 ½ inches or so, and are relatively peaceful when compared with some of their cichlid contemporaries. The Blue Dolphin Moorii is a hit in aquariums because of its striking beauty and pronounced forehead. Something else that makes this cichlid especially impressive is its size. Many grow to be 9 to 10 inches or longer. Blue Dolphins are usually not considered the best pick for beginners, as they require a large tank and are rather high-maintenance pets. 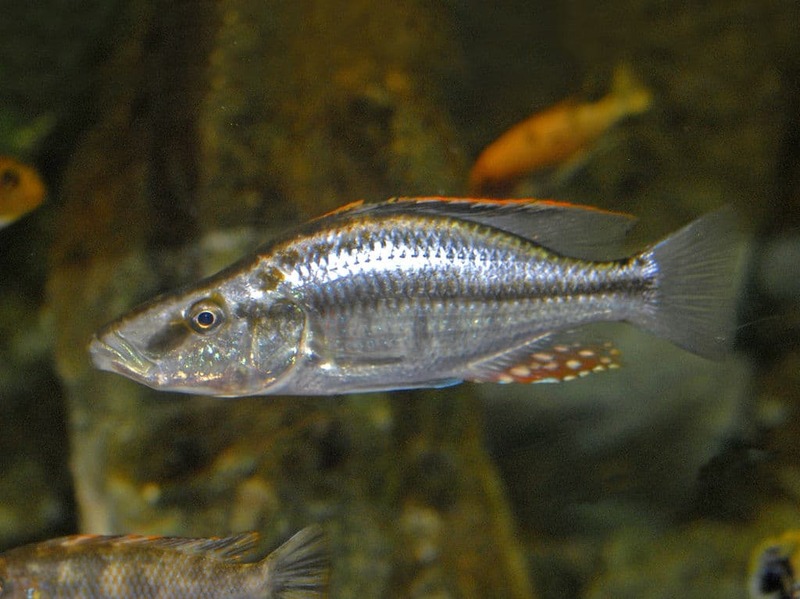 The Maingano is a Mbuna that comes from a very limited portion of Lake Malawi. It is highly attractive, displaying bright blue horizontal striping along with a sleek and streamlined body shape. 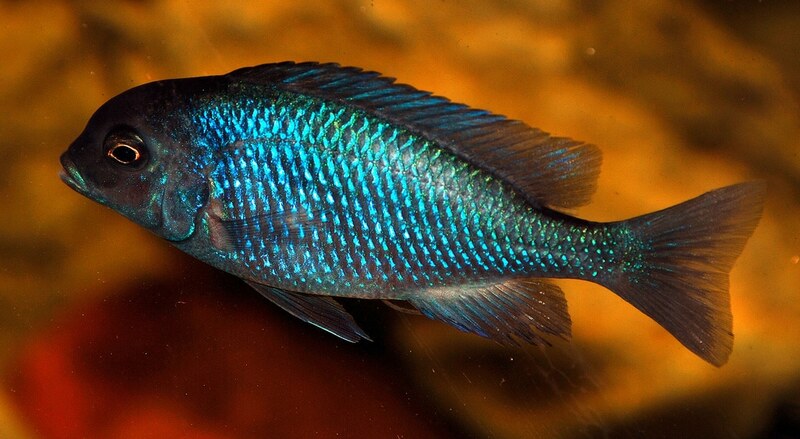 These small cichlids are sometimes mistaken for Electric Blues. This cichlid is sometimes called by its other (and admittedly more intriguing) name, the Malawi Eyebiter. Long and slender, this fish usually displays a shimmering silver color that looks lovely in any aquarium. These fish are large, with males growing 9 inches or longer. They are also aggressive, so you need to give them plenty of tank space and take care when housing them in a community habitat. 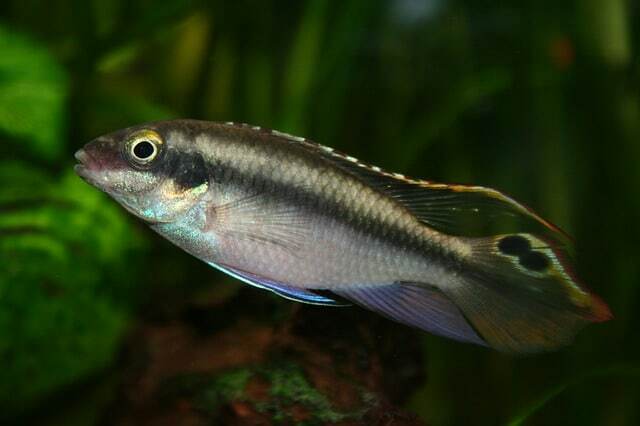 The Kribensis is a dwarf cichlid. It is small, and on the less aggressive side. Because of this, it’s considered a good pet for people just starting out with cichlid-keeping. 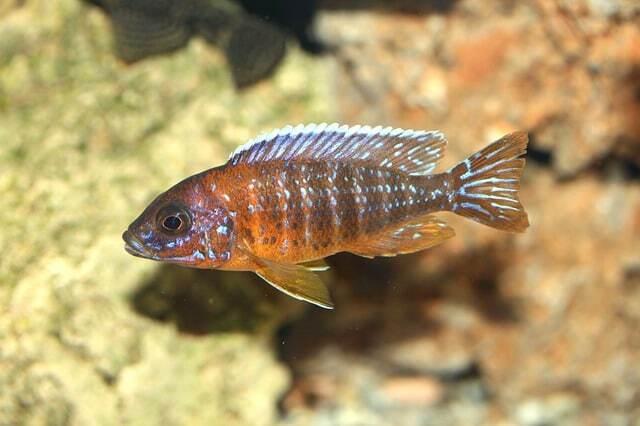 Sometimes called by its shortened name “Kribs,” this small cichlid grows to no more than 3 or 4 inches upon maturity. The Giraffe cichlid, also known as the Venustus, has a bold blue face that stands out against its patterned body. This variety of cichlid needs lots of space since it can grow to be 10 inches or longer. The Giraffe is a more intermediate level fish, since it is known to be very sensitive to water conditions (particularly nitrite levels). The Sunshine Peacock adds a pop of color to the aquarium. Yellow with contrasting blue markings, these fish would sit somewhere in the middle of the cichlid aggression scale. They’re also fairly hardy, often tolerating moderate changes in water conditions. When you decide to populate your tank with African cichlids, know that you’re making a commitment to take good care of your new pets. Invest in the right equipment to keep your aquarium clean and safe. Learn as much as you can about the day-to-day needs of these fascinating pets, and make it a priority to maintain their habitat properly. Your fish will be happier, healthier, and more enjoyable to observe as a result. Different varieties of African cichlids have different dietary preferences in the wild, but most captive cichlids are omnivorous and can adapt to a diverse diet. Generally speaking, it’s best to feed them a variety of foods. Most enjoy cichlid pellets and wafers, as well as frozen tubifex worms and brine shrimp. Cichlids should be fed twice a day. Give them no more than they can consume in 2-3 minutes, or you’ll risk overfeeding them. (Overfeeding can create more waste than your filter can handle, and you’ll have to change the water often or risk unhealthy and potentially deadly conditions in the tank). Before bringing your African cichlids home, you must have a suitable aquarium to place them in. You’ll need one that is of quality construction, with a watertight seal. Ensure that it has been cleaned and sanitized before you set it up for your fish. Smaller African cichlids need a 20-gallon tank, at minimum. Give larger ones (6 inches or above) at least a 30-gallon tank. If you’ll be keeping a community aquarium, accommodate for the number and size of fish that will live there. The general formula is that you will need roughly 2 gallons of water per inch for each additional fish housed in the tank. Remember to base your calculations off mature fish sizes, since juveniles will inevitably get bigger. Most African cichlid aquariums should be kept between 72 – 82 degrees Fahrenheit. Use a thermometer to ensure that the temperature stays within a healthy range. You can use an aquarium heater to keep the water warm enough; be sure the heater is sufficient to heat the size of tank you have. I always recommend the Cobalt Aquatics Neotherm – it is the best heater on the market (in my opinion). Larger aquariums, particularly those kept in cooler locations, may require more than one heater to maintain the right temperature. Like any fish, cichlids create waste that can build up and become toxic. So, you’ll need to have a good filtration system for your cichlid tank. Use one that is on the higher end of what is acceptable for your tank size; cichlids happen to produce even more waste than your average aquatic creature. There are so many aquarium filters available. Ultimately, you must select a quality filter that is suitable for the size and population of the tank. When choosing a filter, it’s important to understand a bit more about them. Biological: Biological filtration is the use of biological media to grow populations of specific bacteria that serve to digest and convert aquatic toxins. Mechanical: Mechanical filtration collects aquarium debris by physically filtering it out of the water. Chemical: Chemical filtration involves the use of chemical media, such as carbon or ferric oxide, to remove unwanted elements from the water. There are a lot of different types of filters on the market. The following list includes the most popular and commonly used. HOB (Hang On Back): As indicated by the name, a hang on back filter hangs on the back of your aquarium. (Though, technically speaking, it can also be hung on the side). This is a really popular choice across the board for fish hobbyists because it provides all 3 types of filtration and doesn’t take up a lot of space in the tank. Canister: Canister filters also provide mechanical, biological, and chemical filtration. They are usually rather large, and a bit more expensive than HOB filters. 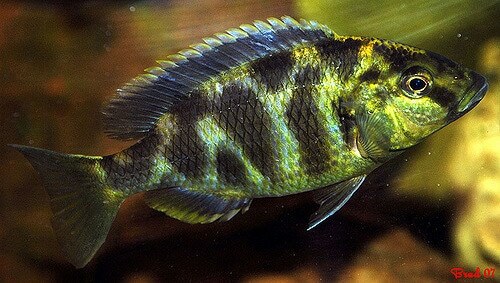 However, many cichlid owners prefer them because they are able to provide powerful filtration for large capacity tanks. Internal: These filters hang inside the tank, taking up very little space. While they do perform all 3 types of filtration, they are usually not ideal for tanks over 20 gallons. Undergravel: Like the name implies, these filters are installed underneath gravel substrate. 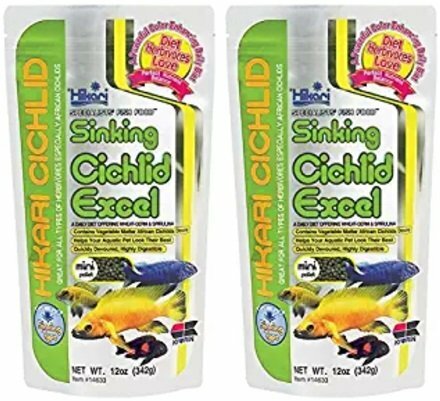 While certainly useful, they may fall short in providing adequate filtration for a cichlid tank since they only allow for mechanical filtration. This is why these are often used in conjunction with other types of filters. Cichlids do not require any special lighting to stay healthy, though you’ll probably want to install an aquarium light so you can enjoy watching them. You can use fluorescent or LED lighting. Note that fluorescent lights can increase water temperature, so keep this in mind when shopping for lighting. 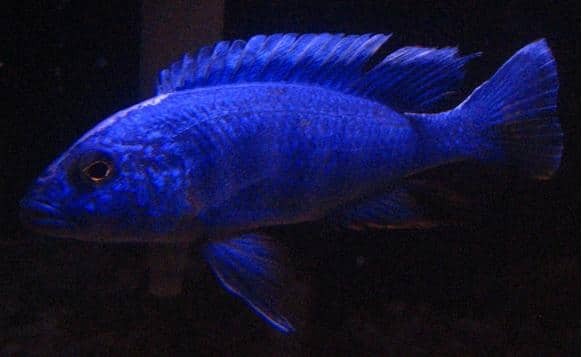 A lot of hobbyists prefer to use LED lights simply because they illuminate the beautiful colors of their cichlids more brightly. t’s also critical to the health of your fish that you maintain the right water conditions. 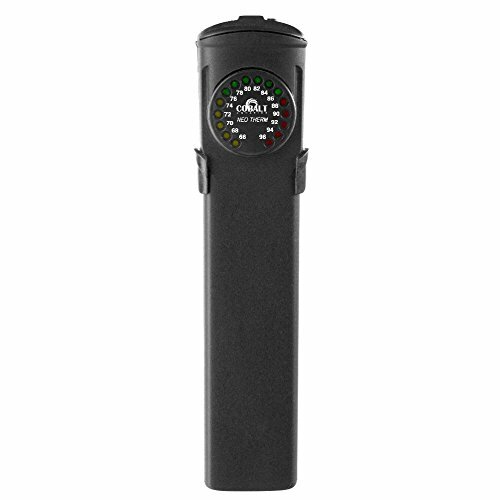 Perform regular cleanings and keep a water testing kit on hand. The API Freshwater Master Test Kit is always my go-to. Many African cichlids love to dig around in their substrate in search of tasty things to nibble on. Choose a substrate that allows them to do this. Sand, crushed coral and small pebbles are all ideal flooring materials for an African cichlid habitat. African cichlids, especially Mbunas, need plenty of rocks in their tank. Cichlids are happier and healthier when they have secret areas to explore and hide behind. You can use rocks, plants, or pre-made tank furniture to create this in your aquarium. In a community tank, these hiding places are absolutely necessary to help prevent fighting over dominance and territory. When placing rocks in your aquarium, make sure they are secure and won’t tip over on your fish. You can use a special waterproof glue to create rock features in the tank, just make sure it’s a formula made to be non-toxic to aquatic life. Don’t be afraid to reach out to the experts with questions as you go. Online forums and fellow hobbyists can be excellent resources, and you can always call your local pet store for advice. Keep reading for some helpful information on being a good, upstanding cichlid-keeper. 1. Always place your aquarium on a stable, strong surface. Use a tank that is in good repair and does not leak water. Ensure that you have a well-secured lid, as some acrobatic cichlids can jump out of an open tank. 2. It’s very important to properly “cycle” a new tank before introducing aquatic life. There are a couple of ways you can do this. Decide on your method and prepare all the supplies you’ll need in advance. 3. Wash your hands thoroughly after cleaning your tank. Sanitize any sinks or other surfaces where tank elements are handled. Don’t clean your fish tank on food prep surfaces, either. Take extra care if you include children in caring for the cichlid tank. Teach them that it’s important to wash their hands before and after handling anything from the aquarium. 4. Keep an eye on your fish. Watch for signs that something isn’t right. The following symptoms could indicate serious problems. If you see any of them, consult a veterinarian. Aversion to food, loss of appetite. Discoloration and/or dullness in fish that were previously colorful. Watch out for potential issues in your aquarium, and also when you’re out shopping for new fish. Always purchase fish raised in a health environment. Don’t bring home a fish that has been housed with sick fish. Be sure to follow any specific care instructions from your breeder or local pet store when you purchase a new fish. These should always supersede any general guidelines. Take care when selecting tankmates if you decide to create a community habitat. First and foremost, make sure there’s plenty of room in the aquarium for your cichlid to have its own space. Fish that will be sharing the waters with a cichlid stand a good chance of being accosted. Aggressive fish will fight back, which could result in injury (or worse) of both fish. Small fish will probably become that day’s lunch. 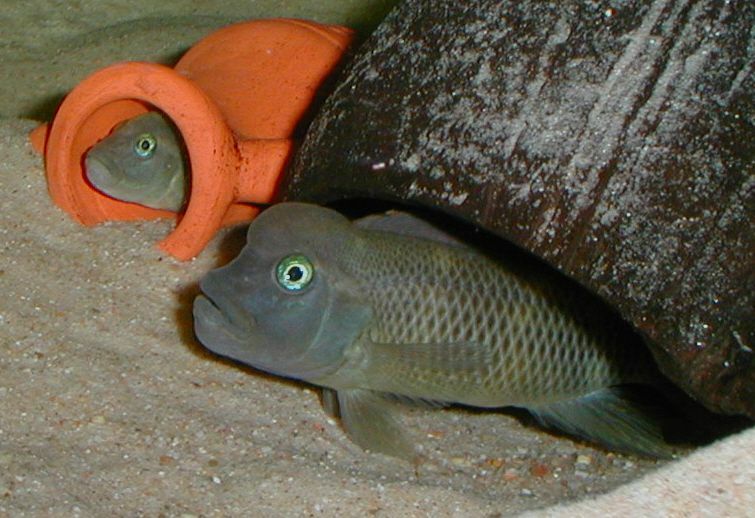 Bottom-feeding fish can make good neighbors for African cichlids. Stick to varieties that are similar in size and temperament. Many people have had success in keeping African catfish with various African cichlid varieties. The two should mostly keep to themselves since they occupy different parts of the tank. However, it’s always possible that the aggressive fish will try to attack one another. It’s best to put multiple types of fish together when all are juveniles. Introducing a new fish to an established cichlid tank is likely to result in injury (or worse). It’s never a good idea to place South American cichlids with African cichlids, as their needs are different. The bottom line is that it’s always risky to place any other type of fish with your African cichlids. Do so only with guidance from a trusted breeder or pet store.